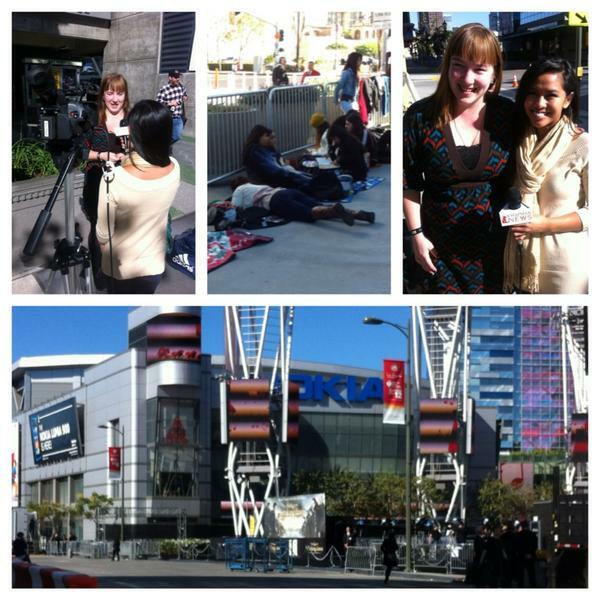 Today Daniela and I went to LA Live to shoot a story on “Twilight Tent City.” When we got there we were surprised to find that Summit Entertainment moved the Twihard campers out in preparation for the premiere. We asked a girl standing with a heavy duty sleeping bag where the camp was and she looked at Daniela and me like we were idiots. That’s how we met Jenna AKA the best Twilight fan ever. Jenna told us about how she fell in love with Stephanie Meyer’s novels, the films, and what the franchise represents today. I’m still working on the pack about her so I won’t give too much away, but she’s changed the way I look at “fandoms.” Everyone should be passionate about something and she made me realize that I love what I do. I’m so thankful that I get to meet so many people like Jenna and tell their incredible stories. 13 Nov	This entry was published on November 13, 2012 at 6:51 am. It’s filed under News and tagged amazing, Azia Celestino, Breaking Dawn, broadcast, Chapman News, Daniela Pardo, Downtown, fan, fifth, film, final, franchise, Jenna, journalism, LA, Live, mania, movie, Nokia, Part 2, personal, report, Saga, Stephanie Meyer, tent city, Twihard, Twilight. Bookmark the permalink. Follow any comments here with the RSS feed for this post. Older: ‘Twilight’ Fever Hits Blacktree TV!